Harm is a physical, psychological and emotional damage that has been done by someone to someone. Physical harm very often is accompanied by emotional and psychological harm, i. e. the person that has experienced harm from another person to their body or property, in addition experiences psychological and emotional harm. However, the harm sometimes can be only psychological or emotional (an example can be bullying, humiliation, shaming, etc.). [Authentic, healthy] forgiveness is an emotional state when the aggrieved party doesn’t feel hurt anymore, feels peaceful and trusts the guilty party again, because the guilty party have understood what they did wrong, they have changed their actions accordingly, and they have made restitution in a way that was acceptable to the aggrieved party. 1. Apologizes, acknowledges and accepts responsibility for the harm they have done. 2. Promises to figure out the causes of their actions and to change their behavior in the future – and keeps this promise. The guilty party has to recognize the responsibility for their actions, accept it without justifications, and honestly declare it – to themselves and to the aggrieved party. 3. Makes restitution (in a way that is acceptable and comforting to the aggrieved party, not to the guilty party). Let’s say that I broke my friend’s window with a rock (the details are not that important). If I want for my friend not to feel hurt, bring back trust, and have a close and loving relationship with them, firstly I have to honestly apologize to them and accept that I’m responsible for the broken window. An explanation like, “I was aiming elsewhere,” “I was drunk,” “I don’t understand the laws of physics” might help my friend to understand the context, but it BY NO MEANS justify the harm that has been done. Then I would have to promise to figure out WHY I broke the window; if I lack information about myself, the laws of physics, the effect of alcohol, etc., I would have to seek this information and understanding. And I would have to make a promise – and keep it to the best of my abilities – not to repeat such behavior in the future. I also would have to make restitution in a way that is comforting and acceptable to my friend, i. e. recompense for a new window, repairing costs, time expenses and emotional discomfort. Whether my friend would feel forgiveness and to what extent is not up to my friend’s wish or willpower – it depends on how effectively I’ll fulfill the requirements for forgiveness. If I fail to meet those requirements or do that improperly, my friend can justly feel hurt, distrust, sadness, or other unpleasant emotions, indicating that (s)he had experienced harm and that our relationship has disimproved. If I correctly meet all the requirements for forgiveness, my friend won’t be feeling hurt anymore, the level of trust will harmonize, and the relationship will go back to normal (it might take some time, but eventually it will happened). 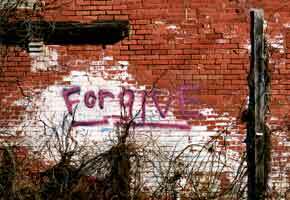 How is forgiveness not achieved? If the guilty party apologizes, but their behavior doesn’t improve, then it’s obvious that either they don’t understand the motives and consequences of their actions – or they just don’t care about the fact that they are acting in a harmful manner. 1. The guilty party didn’t meet the requirements for forgiveness fully or they did meet them incorrectly. 2. Some requirements are not possible to meet. It might be that the guilty party is incapable to understand the harm or their responsibility; or they can’t change their behavior; or they fail to understand how to make a proper restitution; or they don’t have enough resources – or making restitution is just not possible. Since after experiencing harm a person feels hurt, anger, sadness, confusion, fear, and/or some other unpleasant emotion, and since such emotional state might last a while, the aggrieved party sometimes convince themselves – or is convinced by somebody else – that they SHOULD repress those unpleasant emotions and MAKE themselves feel forgiveness and act as if everything’s fine. This phenomenon is called pseudo-forgiveness (or false forgiveness) and it often is the reason why people experience some serious mental, physical, and social health problems. 1. Doesn’t understand, deny, or minimize the harm that has been done to them. 2. Feels unjustly guilty. They blame themselves either for what happened to them, or for the fact that the guilty party feels bad (also see #4). 3. Feels confused. They have irrational or even contradictory thoughts, for example, “Yes, my husband beats me, but he’s my husband, and I’ve promised to be with him till death do us part,” or “It’s true that my parents caused me a lot of pain, but I have to love my parents and forgive them everything, because they are my parents / The Bible says so / everyone around me says so.” Such mental states are called cognitive dissonance, doublethink, cognitive distortion, or simply errors in thinking and logic. 4. Empathizes with the guilty party too much. Such state is called Stockholm syndrome, where one feels empathy and sympathy towards one’s abusers, or even thinks that (s)he loves the abuser or that they both love each other. 5. Is afraid of other people’s reactions. One is afraid that if one recognizes the harm and the unpleasant emotions (anger, hurt, sadness, etc. ), then others might laugh at them, condemn them, humiliate them, hurt them even more, misunderstand them, reject them, and minimize or justify the harm. 6. In any way stops the natural process of acceptance and grieving of the harm they’ve experienced. What if the guilty party fail, don’t want to, or can’t meet the requirements for forgiveness? The fact that the guilty party fail, don’t want to, or can’t meet the requirements for forgiveness doesn’t mean that NO relationship with that person is possible. However, one has to keep in mind that the worse the requirements for forgiveness are met, the more restricted, shallow, or even dysfunctional the relationship is (whether both parties consciously recognize this fact or not, doesn’t change this very fact). So, it’s useful to evaluate, how valuable this by-harm-restricted relationship is for you. If you’re satisfied with it – great! If not, keep in mind that you don’t HAVE to be satisfied with it – or even be in it at all. It often might be the case that the guilty party fails to, doesn’t want to, or can’t meet the necessary requirements for forgiveness. It might be that you’ll never see this person again (for example, if you have been robbed). It might be that full and adequate restitution is not possible (for example if your loved one was killed). Does the fact that the guilty party fail to meet the necessary requirements for forgiveness mean that the aggrieved party will be unhappy for the rest of their life? Well, no. If one fully completes the natural process of grieving and accepting of the harm and loss they’ve experienced, then after some time one goes back to a healthy, authentic (NON-PSEUDO) state of calmness, awareness, focus, mindfulness, and happiness. Tiesiog puikiai sudėliojai visus taškus ant "i". Ačiū, Dariau!